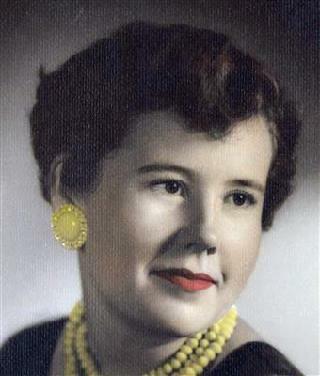 Peggy Roberta Stephens Yown, 80, of Tuscola, passed away January 20, 2015. A funeral service will be held at 1:00pm Saturday, January 24, 2015 at First Baptist Church, Tuscola, directed by Fry~Smith Funeral Home, Tuscola. A visitation will be from 4:30 to 7:00pm Friday January 23, at the funeral home. Peggy Bob was born on September 20, 1934 to Walter and Gladys (Maxwell) Stephens in Buffalo Gap. Peggy Bob graduated from South Taylor High School in 1953. She married Robert (Bob) Yown at the Dyess Air Force Base Chapel on December 21, 1956. Peggy Bob and Bob where married 56 years, she was a devoted military wife and mother. Peggy Bob worked for Timex, J.C. Penney and several grocery stores in Tuscola. She was a beautiful woman inside and out. She always tried to make everyone feel special. Peggy Bob's family was very important to her. She was a very proud and very vocal sideline grandma at as many activates and sporting events she could attended. Peggy Bob is survived by her children, Susan Roberts and husband Philip of Bangs, Kelly Meyer of Abilene, Shelly Yown of Lubbock, and Robin Yown of Garland; brother, Billy Mac (Bud) Stephens of Tuscola; sister Cora Lee Ross of Sand Sprigs, OK; grandchildren, Judson Patton and wife Erica of Lubbock, Brooke Clark of New York, NY, Brittany Meyer of Abilene, Jacqulin Fulfer and husband Wade of Tye, Earl Johnson Jr. and wife Meagan of Nebraska, J. W. Johnson and wife Geena of Brownwood, Aden Bartek of Lubbock, Kiefer Bartek of Houston, Rae Glasscock and husband Rusty of Bangs, Sara Earls and husband David of Irving, and Nikki Roberts of Bangs; great grandchildren, Clay and Maddox Patton; Jonathon Mlenak; Teegahan, Rylie and Alee Myer; Ronnie Johnson; Braegan, Larkyn, and Kimber Glasscock; Keela Bartek-Bishop; Dylan Earls; Jacob and Ashley Fulfer; Skie, Kaydance, Charlie, Casey, Olen III, Seth Johnson; Owen and Emalyn Johnson; and many special nieces, nephews, and cousins. She was preceded in death by her parents, husband Bob Yown, brothers, Rudy "Whizzer" Stephens, J.W. "Tuck" Stephens, George Glen "Red" Stephens, sisters, Maxine Pierson, Inez Pierson, son-in-law Richard Meyer, and great grandson Miles Gene Johnson. Pallbearers for Peggy Bob will be her grandchildren. A very special "Thank You" to Cross Country Healthcare Center in Brownwood, for the wonderful care she received during her stay.